Direct acting pressure regulators (12-35 psi) are specifically designed for use where accurate and reliable control of line pressure is required, regardless of fluctuations in upstream pressure and/or flow. The use of a rolling diaphragm completely separates the spring assembly from dirt or contaminants in the flow stream and provides long, trouble-free service while ensuring immediate response to flow and pressure variations. DIG pressure regulators should never be installed on a mainline where they are under constant pressure. In this situation, they need to be installed after the valve. Color black with white cap: Adjustable with a single screw. Minimum psi 12; Maximum psi 35. Pressure range: 12 to 35 PSI. Maximum inlet pressure: 125 PSI. Flow range: .2 to 22 gpm. Dimensions: 4" H x 3 7/16" W.
Use one of these regulators if your house pressure exceeds 60 psi. Check your Pressure! 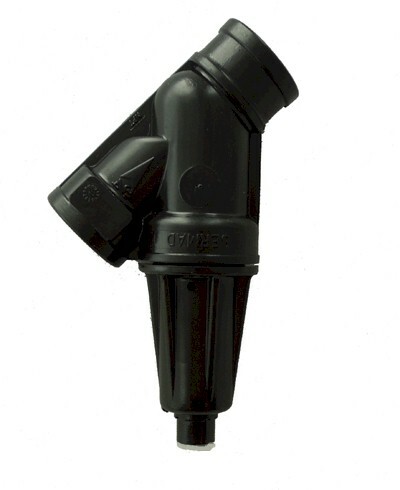 Tip: This regulator is PIPE thread and WILL NOT fit on a faucet. If you wish to use it on a faucet, you need the two fittings listed below. One last thing.........the regulators have an arrow for the direction of the water flow. Don't put it in backwards and call and say it doesn't work at all, Duh!